SOLD $228,250 LIVE AUCTION!! 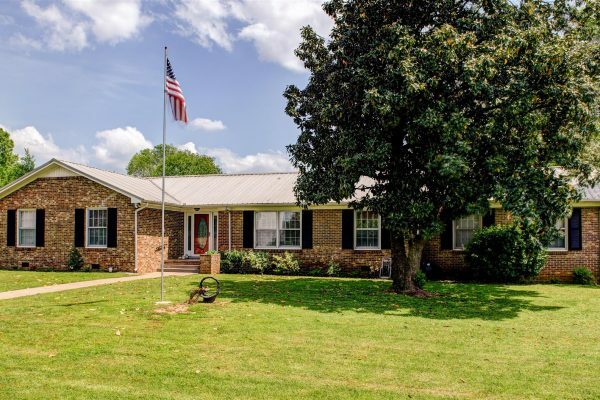 4 BR, 2 BA / One Level | Middle Tennessee Real Estate :: Maples Realty & Auction Co. This home is neat as a pin! It’s hard to find a 4 bedroom, 2 bath home all one level situated on a corner lot! The interior features a living room/dining room combo, as well as a separate den with a gas fireplace, with hardwood and tile flooring throughout. This home also includes a 2 car garage, as well as a detached 2 car garage/workshop wired with a 50 amp plug in for a motor home, and a storage building. The location of this home is ideal as it is on a nice quiet street yet close to all the conveniences. Personal Property: Curio cabinet, dining room table and 6 chairs, small desk & chair, sofa, 3 pc bookcase, desk, nicknacks, side by side Whirlpool refrigerator, vacuum, 5 HP Craftsman air compressor, TV trays, wood stool, white rocking chairs, box blade, 1953 Ferguson – 30 tractor, Craftsman 22.5 HP mower, tools, refrigerator, utility trailer, and more. Directions: From South Church Street turn Right on Warrior Drive. Right on Magnolia Drive. The house is on the right.